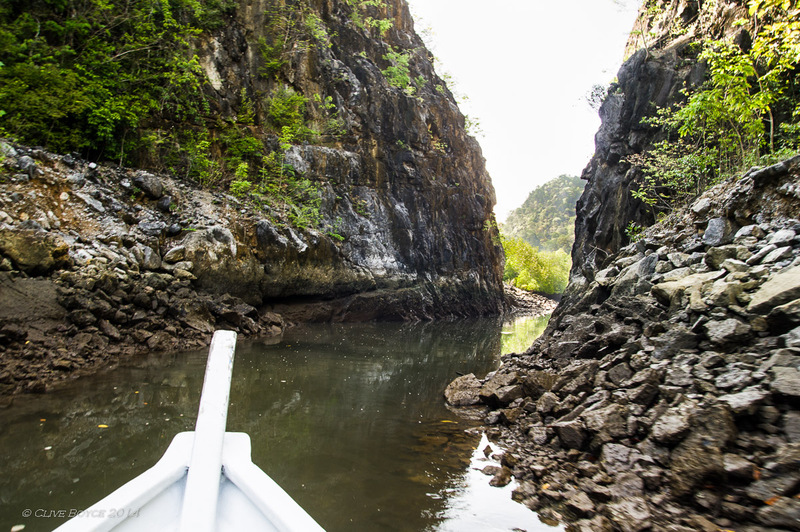 Photo Morsels continues its exploration of Langkawi with a visit to the Kilim Karst Geoforest. 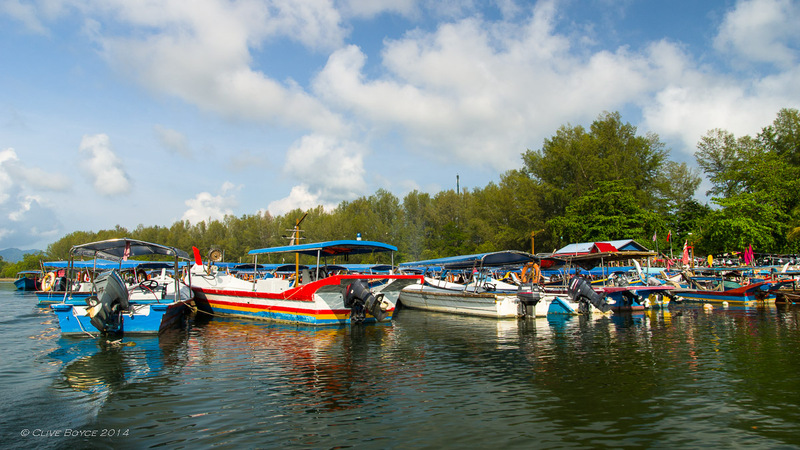 Prior posts have introduced Langkawi and noted its declaration as a UNESCO Geopark in recognition of the island’s relatively unspoilt environment and unique geological features. 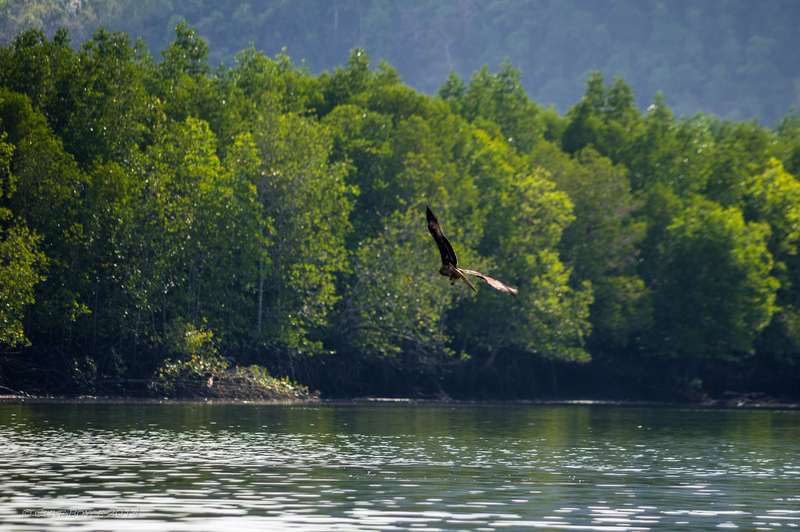 Langkawi contains three major geopark areas and a number of smaller sites. The previous post visited the Machinchang Cambrian Geoforest Park. 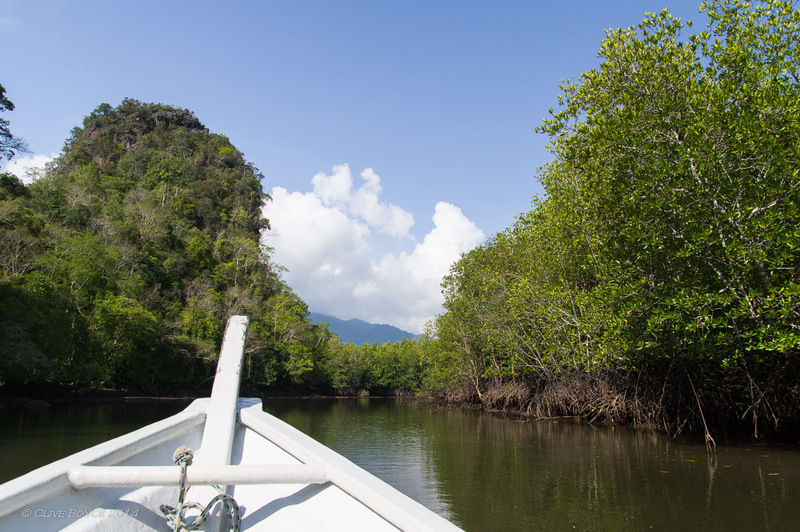 This post turns its attention to the Kilim Karst Geoforest at the opposite end of Langkawi Island to Machinchang. 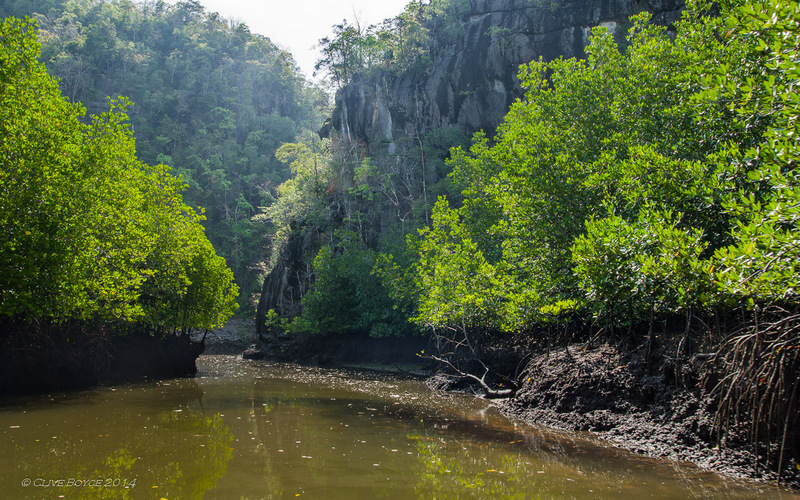 To quickly summarise the Kilim Karst Geoforest, it is a network of mangrove waterways that takes its name from the Kilim River, one of three rivers in the area and from the geological term ‘karst’ which is used to describe landscapes formed from the dissolution of soluble rocks such as limestone, dolomite or gypsum. It is this karst topography that makes the area quite special. Words can’t really do the beauty of this area justice, so let’s just get on with the photos. Our boat trip started at Tanjung Rhu where there’s quite a flotilla of long boats waiting to service the tourist trade. On our way into the mangrove waterways. 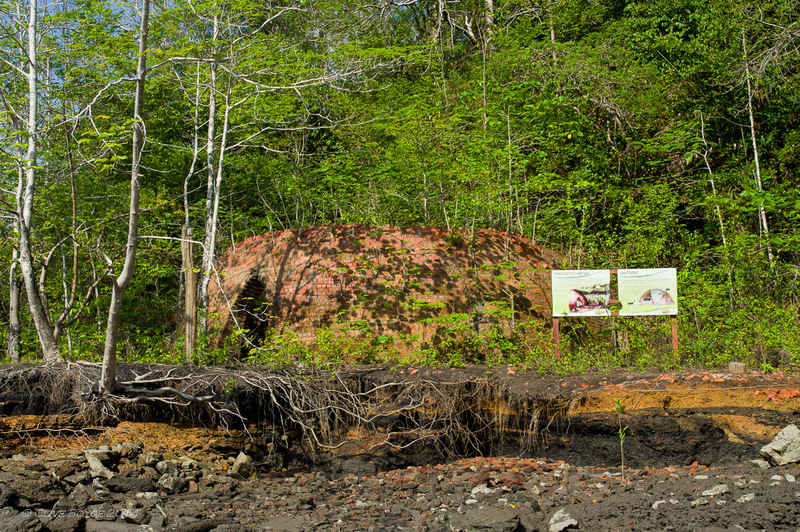 Before the area was declared a geopark, local villagers cut mangrove trees and burnt them for charcoal. This is the remains of a now abandoned charcoal kiln. 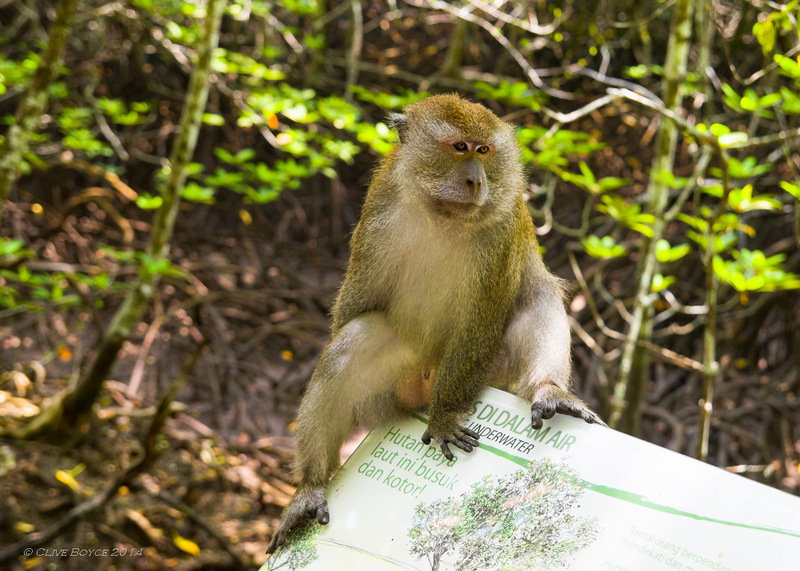 Our trip up the creek was being observed by one of the local macaque monkeys. With the tide out, this narrow cutting din’t provide our boat with much maneuvering room. Accessible only at low tide, we entered the Crocodile Cave. 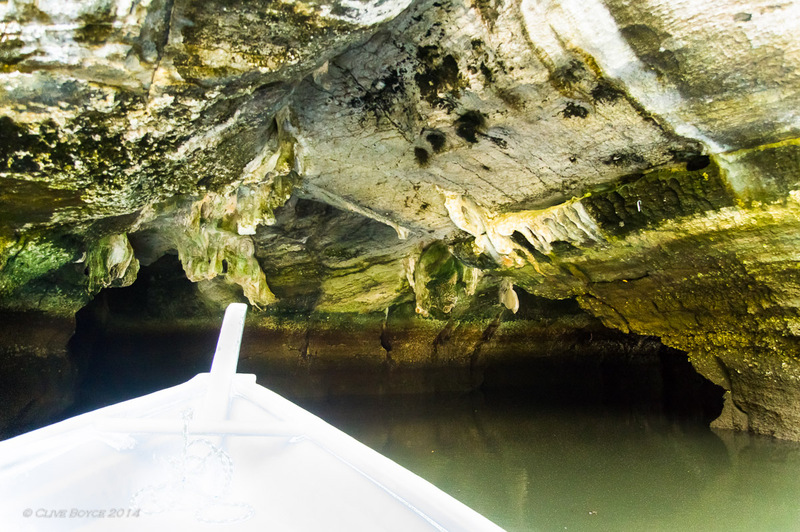 The cave forms a navigable tunnel and allows the tidal creek to flow right under one of the limestone hills. 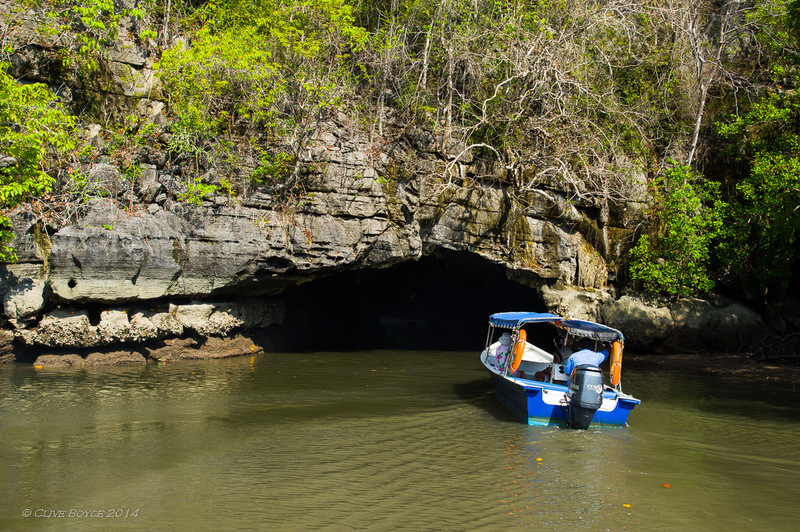 As we leave the Crocodile Cave from the other side, another tourist boat prepares to enter. Next up, we moved to a wider stretch of river frequented by brahminy kites and the occasional sea eagle. Small pieces of chicken are used to bring the birds close to the boats. This practice is somewhat controversial as it changes the natural behavior of the birds living in the immediate area. Birds in flight must surely be one of the most challenging photographic subjects. This was the best I could come up with from a dozen or more attempts. 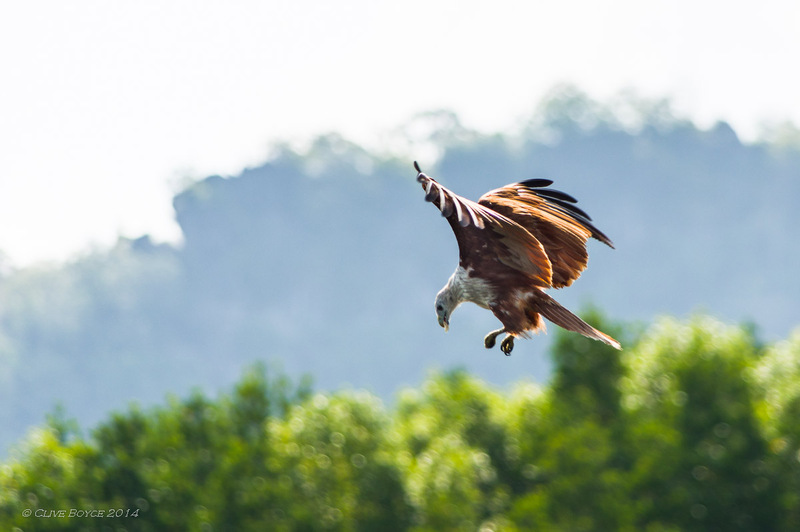 This brahminy kite has just transferred a piece of scooped up chicken from its talons to its beak. 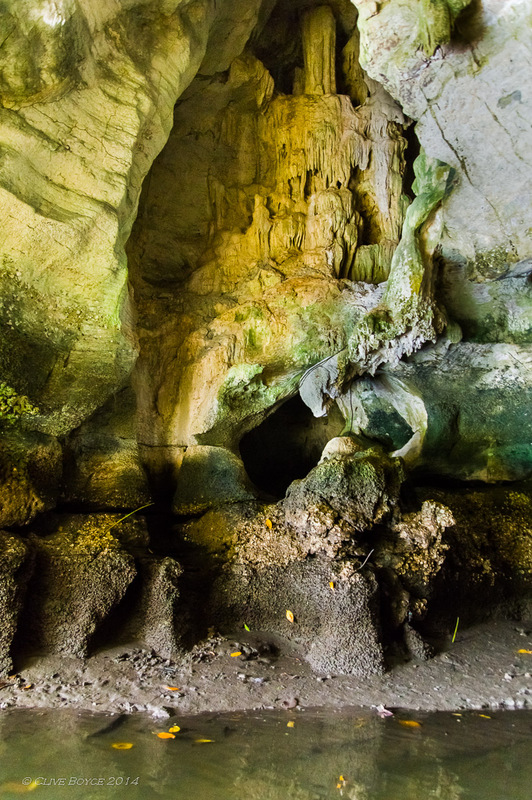 The limestone topography of the area lends itself to the formation of caves. One of the larger caves houses a colony of bats. 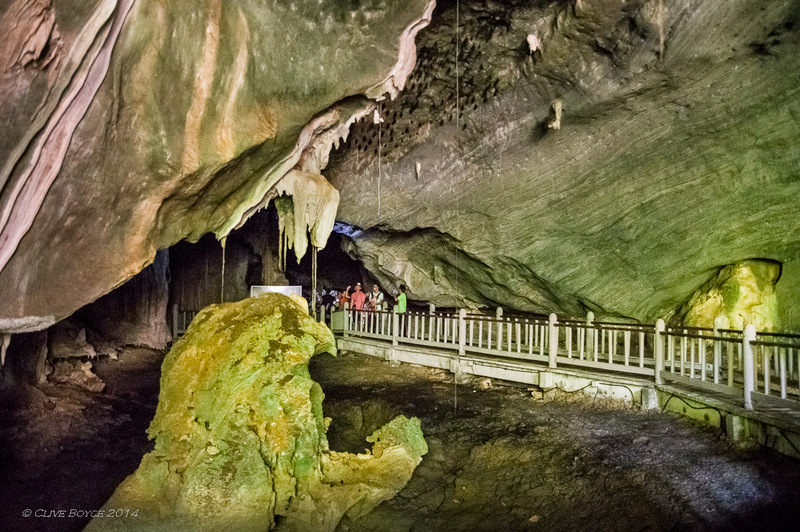 Tourists can enter the cave after paying a modest fee to the local villagers. The cave was much darker than this photo might suggest – no flash was used here out of consideration for the bats and the other visitors. Instead I pushed the camera’s sensitivity up to ISO 12,800 but still needed to use the lens wide open at F2.8 and with 1/20th second exposure. By my calculation that represents 1/16,000ths of the light available outdoors on a sunny day. 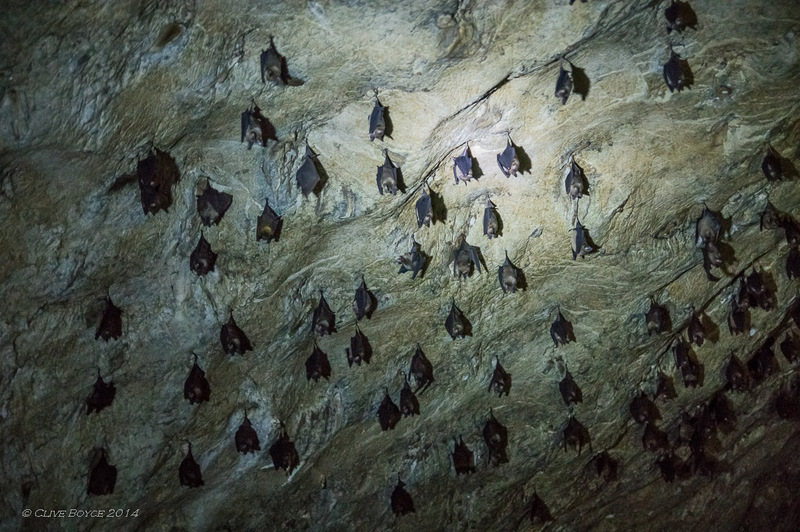 The camera reveals bats hanging on the roof of the cave, but the viewing with eyes only reveals nothing. A guide needed to shine a torch onto the bats before any could be seen by eye. The floor of the cave is flooded each day by the incoming tide which has the beneficial side effect of washing away most of the bat poo. 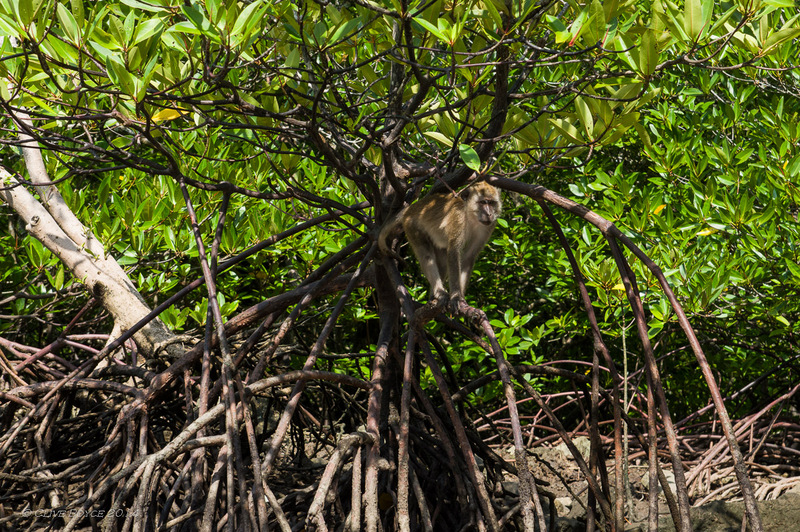 On leaving the bat cave and continuing on a board walk through the mangroves to return to the boats, visitors came under the close scrutiny of yet another macaque monkey. Macaques are quite aggressive in snatching food, cameras and other personal belongings, so it is wise not to wind one of these monkeys up. This one though seem quite happy to pose for photos while a steady stream of tourists passed by only two or three feet away. Continue on to the second page of this post by clicking here. 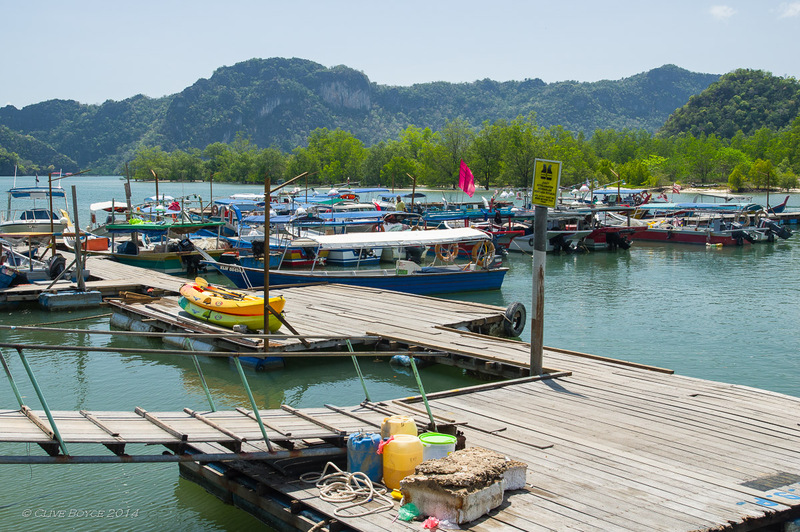 This entry was posted in Malaysia, Overseas Travel Locations, Places to Visit and tagged Geopark, Kilim Karst Geoforest, Landscapes, Langkawi, Langkawi mangrove boat tour, Malaysia, Photography, places-to-visit, Seascapes on July 30, 2014 by aussiesouthlander. Hey Clive Go to bed! Just about to enjoy my pre dinner Jupiler. Great photos incidentally.